Of all Edden Hammon’s musical acquaintances the Hammonses speak most vividly of the notable Randolph Countian Wren McGee, who died in the 1930s. The undisputed champion of his region, McGee reportedly held the Elkins championship for many years running before relinquishing the crown to his nephew and understudy, Gus McGee. 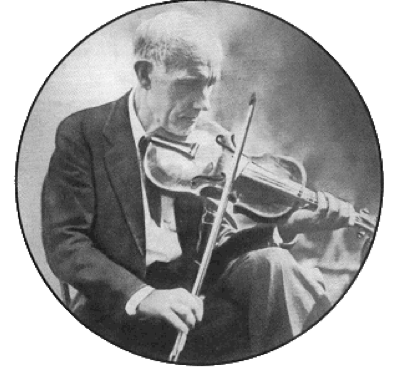 Smith remembers several visits to the McGee home on Riffles Creek about 1915 or so and states that his father learned ‘Birdie’ among other tunes from the elder fiddler. Currence Hammons, Edden’s musical sidekick during his stay in Randolph County, corroborates Smith’s belief in telling his eyewitness version of the first meeting between the two champions. Here come Edden, a-carrying his fiddle in a flour poke – oh be one of those twenty-five pound flour pokes, you know, and the bow would stick up about that high out of the top of the poke … He come there, ‘Come in,’ it was a-sprinkling rain and Wren was a-setting there playing the fiddle, you know. Oh, Wren was a good fiddler, there’s no question to it, but he’s a tall slim feller. I’ll bet you his fingers, was way oh, my Lord, not much longer than mine. Just little old peaked things. Edden said, ‘ ‘Birdie’? ‘Pon my honour I never heard that.’ And now I never’d hear’d it. I never did hear till I hear’d Wren play it. And I was sitting there by him and I said, ‘No, I never hear’d it.’ ‘ ‘Pon my honour,’ Edden said, ‘Play it, I want to hear that.’ Well Wren, he played ‘Birdie’, Edden said to him, he said, ‘Play ‘Be All Smiles Tonight’ ‘ and Edden could play that. He played that, he played it. And now he said, ‘Mr Hammons, I’ve heard a lot of talk about you. I want to hear you play one.’ ”Pon my honour,’ Edden said, ‘I can’t play. But,’ he said, ‘I’ll try.’ He went to get his fiddle, you know, and Wren said, ‘Here, play on mine.’ Edden looked over, ‘Oh no, on my honour, I’ll get mine.’ He just went over and pulled her out of the flour sack. And the flour sack was wet, you know. It’d rained on it, it was really sprinkling rain when he’d come in. Pulled her out and tucked the fiddle and knocked the old flour out of it and blowed it off. Wren just stood and looked at him. Now, he never took his eyes off him. Indeed that fiddle was white of flour all over it. Took an old handkerchief out of his pocket and knocked it off of the strings and swept it off. Well, he played, ‘Be All Smiles Tonight’, the first one Edden played. Wren stood and listened at him. Wren never said a word. But Edden, Edden said to him, he said, ‘Mr. McGee I want to hear you play that ‘Birdie’ again.’ He said, ‘I never heard that piece and my honour that’s a good one.’ Well Wren got his fiddle. He went to playing it, you know. Edden a-standing there and listened at him. After he played it, Edden said ‘On my honour, I wonder if I can start it?’ He went to fooling over the fiddle, trying to get the notes to ‘Birdie’, and he found them. Currence notes that his Uncle Edden routinely toted his instrument around in a flour sack, much to the amusement of those around him. “The violin had a weasel head on it, you know, at the end of the neck over here where the keys was – a weasel head and ah, had its tongue a-sticking out … that’s the one he carried in the flour poke. That’s the one that me and him played down here at Elkins for the first prize we won first prize with. I never hear’d such hollering and laughing as people [did] in my life. Edden, oh they had them nice one hundred dollar fiddles and them they said was cheap, and they said, well, it come Edden’s turn he just walked over to the corner and picked up the flour poke and they all got to looking to what he was getting. He pulled that old fiddle out and flour was all over it. He dusted it off, blowed it off, you know. Some of them went to laughing and hollering about that flour.